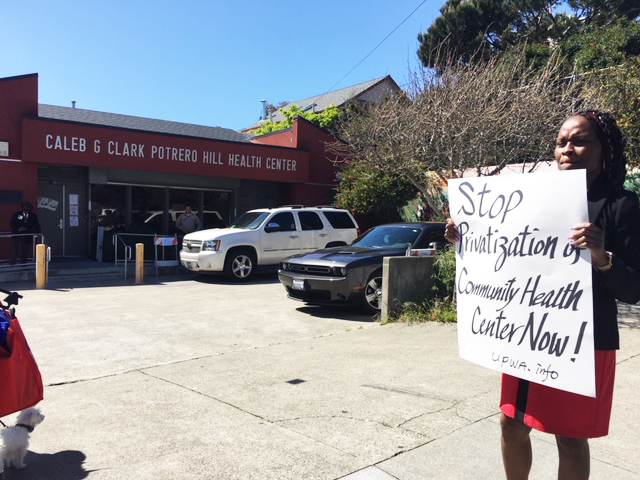 Community and labor advocates rallied on Friday, April 20, 2018, at the San Francisco Potrero Hill Health Center to call for an end to the privatization of the center by Department of Public Health Director Barbara Garcia and also the retaliation against the center’s worker Cheryl Thornton, who is a member of SEIU 1021. The management has a history of workplace bullying and racist work practices against the African American workers. Community members are angry that the clinic, which was founded after a long struggle, is being destroyed by city privatizers. There was also a previous rally to oppose the systemic racist policies at other San Francisco neighborhood healthcare centers. 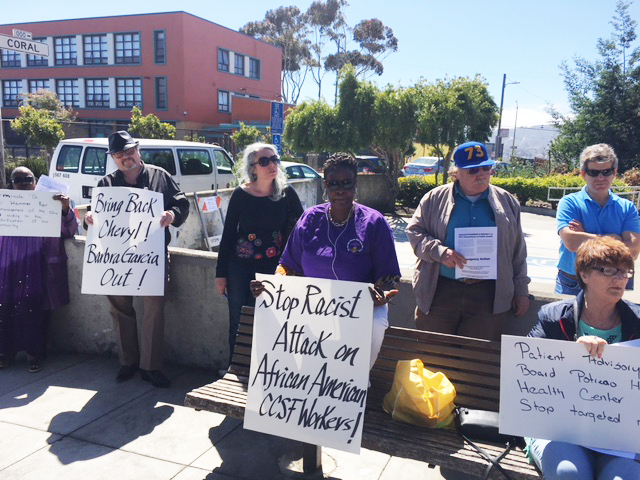 The rally was sponsored by the Patient Advisory Board for Potrero Hill Health Center. 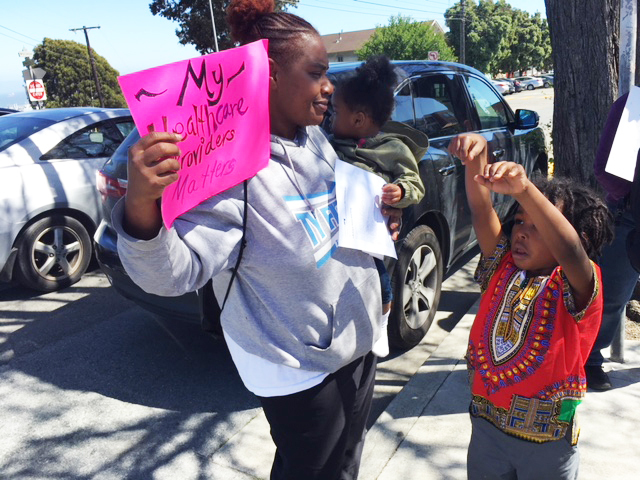 Thousands of San Francisco families and residents rely on the services facilitated by the City’s Department of Public Health (DPH). We expect this important city to live up to our shared values of fairness, collaboration and respect. Our city’s health and well-being depend on it. The New York Times recently published a series of articles about the dangers of privatizing public services, the first of which was called “When You Dial 911 and Wall Street Answers.” Over the years, the Times has published other exposés of privatized services, like hospitals, health care, prisons, ambulances and preschool for children with disabilities. Privatization means that a public service is taken over by a for-profit business, whose highest goal is profit. Investors expect a profit when a business moves into a new venture. The new corporation operating the hospital or the prison or the fire department cuts costs by every means to increase profits. When possible, it eliminates unions, raises prices to consumers – even charging homeowners for putting out fires – cuts workers’ benefits, expands working hours and lays off veteran employees who earn the most. The consequences can be dangerous to ordinary citizens. Privatization means that a public service is taken over by a for-profit business, whose highest goal is profit. That’s why it’s troubling to learn that management at DPH refuses to address the staffing and workload issues that are negatively impacting public services. Employees who do important yet often overlooked work are also facing threats to their job security, with the reduction of their duties and responsibilities. In addition to being unresponsive to issues related to staffing and workload, workers report that management is disproportionately disciplining African American employees and separating them from probation at alarming rates. Discrimination has no place in our city. Together we must use our power in numbers and demand that DPH investigate how management is unfairly using disciplines and separations from probation. We must end the fear and intimidation of our coworkers. We, the undersigned Department of Public Health employees and community members wish to notify you of our utmost concern over the department’s reductions in staff regarding physicians, nurses and operation supervisors. We have created a list of demands: 1) STOP the privatization of the Potrero Hill clinic; 2) Restore staffing levels so patients have access to healthcare in a timely manner; 3) Terminate Dr. Halie Hammer for mismanagement of the clinic and aiding in the gentrification of our community; 4) Support creating a citywide Patient Advisory Council that meets and reports to City Hall to ensure services are being maintained; 5) RESTORE the 1408 Principal Clerk to the Potrero Hill clinic; 6) Demonstrate equity and cultural competency in staffing our clinic. The Patients Advisory Board of Potrero Hill Health Clinic can be reached at patientadvisoryph@gmail.com. Potrero Hill has been a great clinic and will continue to be one.. I live in the neighborhood and couldn't be happier with the service there. They ARE NOT Privatizing the clinic. Truly helpful and friendly Smok Fit Ultra Portable vape I am going! I'd immediate vapor assist me to these days was great :)! Good way having a great selection! If you need help ask from them he'll look after you. My first-time Gases right here really solved the problem out and demonstrated everything I desired to understand! Great service!!! Psychological health is past residing a stress-free life. It's the ability to take control of your emotions, possess proper cognitive abilities and conduct along with well. Depressive disorders Healthy Dietmay be the main characteristic of the mental health problem among the senior citizens. Good care is mandatory when handling the senior citizens as they possibly can is afflicted by bad psychological wellness due to physical health issues as well as nice. The quantity of drug abuse inside the administrative center, regardless of the drug of preference, way a persevering with the need for drug tests. Pre-employment screening highlights users earlier than they accumulate a settlement. Random drug assessments carry a spotlight on those intoxicated across the place of job. Because the varieties of drugs in the market change, so must the drug panels detecting them IAJGS2015.org.